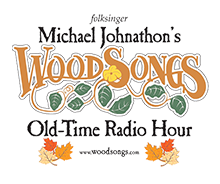 Ringmasters, our 2012 International Quartet Champion, headlines a wide-ranging cast of barbershop performers on episode 854 of WoodSongs Old-Time Radio Show, premiering this weekend on more than 500 radio stations in the U.S. and around the world on the American Forces Radio Network. Check your local public radio station listings for show time in your area. The video edition of WoodSongs will air later in the fall, but in the meantime, here are a few peeks from the WoodSongs YouTube Channel.